Surrender at 20: Red Post Collection: Chat Systems Forecast, Response to new Match History Feedback, 4.11 Hunter's Machete, and more! Red Post Collection: Chat Systems Forecast, Response to new Match History Feedback, 4.11 Hunter's Machete, and more! Tonight's red post collection features Riot Metasystem with a forecast on Chat Systems, including goals for the future and the imminent disabling of public ( not private ) chat rooms. You'll also find IronStylus discussing Akali's visuals and VU timing, a response to feedback on the new match history that is live on several servers, and Phreak commenting on the upcoming Hunter's Machete changes. Red Post Collection: Context on 4.11 Braum Changes, Meddler on Zilean / Poppy / Viktor, Ironstylus Grab Bag, and more! Here's Riot Metasystem with an announcement regarding the in-client Chat system and Chat rooms, including that public ( not private ) chat rooms will be disabled until "they're useful and accessible". Riot Metasystem here to talk to you about our chat room system. Many have pointed out that there are some flaws and I'm here to discuss those issues and solutions to address them. The official public chat rooms have grown rife with RP sellers, scammers and Elo-boost spam. The default four rooms we established can be used by a tiny fraction of our players at a time. Given the number of League players, most conversation spills into private, community-created rooms. Unfortunately, private chat rooms and even the awesome community hubs like Dominate Dominion and Summoner School lack moderation tools beyond the ignore button. While the experience in private chat rooms is better than the public versions, we still want to provide tools to address unwelcome drop-ins and toxic behavior. Long term we’re exploring and working on major and minor improvements to chat and chat rooms aimed at enhancing usability and adding new functionality. As an immediate action we’re going to disable the public chat rooms until they’re useful and accessible. In their current shape they just don’t work and can actively create negative experiences for many players (especially new players). We’ll keep all private chat rooms and messaging available to everyone, and bring the official public chat rooms back as soon as we can. Now that we’ve talked about the current state of chat and some of our first steps, I want to explore what our goals for chat are. We’d like to create a persistent hangout for the friends you play with. Those friends should bring in their like-minded friends as well, and the badass players you meet playing great games. While you're at it, why not invite some players from the community as well? At the end of the day, when you log in you should feel like you're surrounded by active players that like to play League the way you do. You should be to able jump easily into games with those friends - - without having to send game invites one by one. Whether we call them chat rooms, hangouts or communities, they could grow to serve many purposes. Players could build a community for junglers, a mentoring group, a champion theory-crafting channel, or casual ARAM or Team Ranked LFGs. Some great communities like these already exist in League but it's not easy to manage them well. When we think about these social spaces, we think a good starting point to solve the existing problems is a solid set of tools that empowers players and Riot to create, own, and manage all kinds of different social environments. Right now we’re looking for your feedback. Tell us what you’re looking for in our chat rooms, and how we can provide you with the right tools to make them into strong communities. We'll work on the improvements at a steady pace, and keep you posted along the way. Join the discussion below! "I don't think she'll be up for anything anytime in the immediate future. She has some pretty janky things in her model (bad deformation, noodle arms, etc) but overall she's not *that* bad. I think she's actually pretty distinct as a character. She would however benefit quite a bit from a texture update and some geometry tweaking to make sure her elbows, knees and ankles bend appropriately. To my knowledge we could address those with some rig changes." "That'd be RiotSilver's domain. Not sure where she stands on a splash update." "Akali theoretically wouldn't need as much of a thematic overhaul as Caitlyn. That and other factors tend to push Caitlyn to a higher position of priority, such as visibility, approachability of the champion, "visual health" of the champion, etc. She's one of our more popular characters, especially where ADC's are concerned because she's sort of "entry level"." "We don't prioritize by order of initial release. Each champion is looked at independently. My personal opinion is that Ezreal could use a lot of love though." No, because there's a huge discrepancy with early champions in terms of quality. Akali, Vlad, Malzahar, quite as in need of updates as say Urgot, Swain, or Caitlyn. That's sort of arbitrary and debatable in terms of quality difference, but it's mixed bag. Actually, a number of champions had VU's in order-ish, such at Annie, Ashe, Kayle, Master Yi, Soraka, Twisted Fate, etc. Not exactly down the line, but close. When we prioritize, we also look at the scope of work. Like, it would be difficult to do Ryze and Morgana in close proximity because of how much work their models, animations and VFX would need. Those are fairly large scope. While melee characters or ones that don't have a ton of whacky animations are lower in scope. Each thing is a case-by-case undertaking. 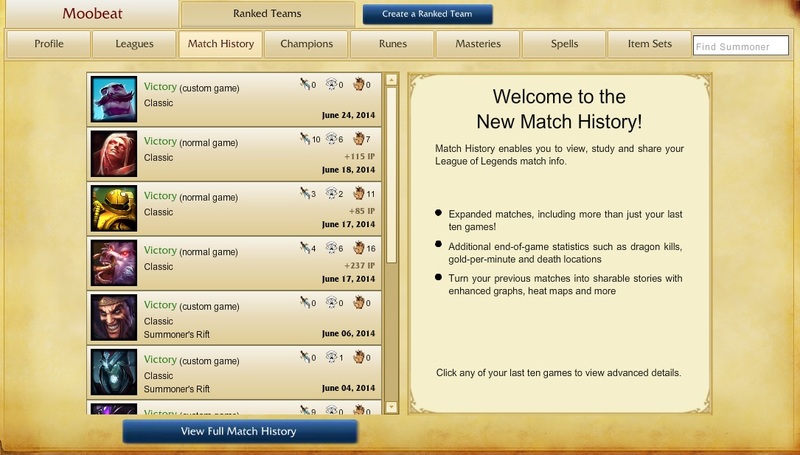 While the new Match History Beta is still rolling out to all servers, Riot Matt Enth posted on reddit that they will be adding an in-client "at a glance" view in response to feedback about the new system only being available on the web. We've heard this feedback loud and clear. We agree that there's currently too much friction between the client and website, so we're bringing back the "at a glance" view of your last 10 matches. We've been testing it on the PBE and intend to roll it out with the next patch. We're still working on getting the new Match History to NA/EU, but are being extra cautious in how we manage load on those regions. We capture a ton of data for every game played, and we want to make sure that Match History won't just tip over (or worse, take down other things with it). Please keep the feedback coming! We've got several performance optimizations coming down the line, and we're looking at exposing even more interesting data for each of your games. With Hunter's Machete receiving a few changes in the upcoming patch 4.11, Phreak punned by the forums to give a bit of context on the changes with regard to what was mentioned in the 4.11 patch forecast. "Keep in mind the old Machete style regen benefited champions like Lee Sin, Vi, and Nocturne: Ones with really high attack speed. By being damage reduction instead, the "regen" given to fast clearers is much lower than the regen given to slower clearers, since it will block more damage overall."